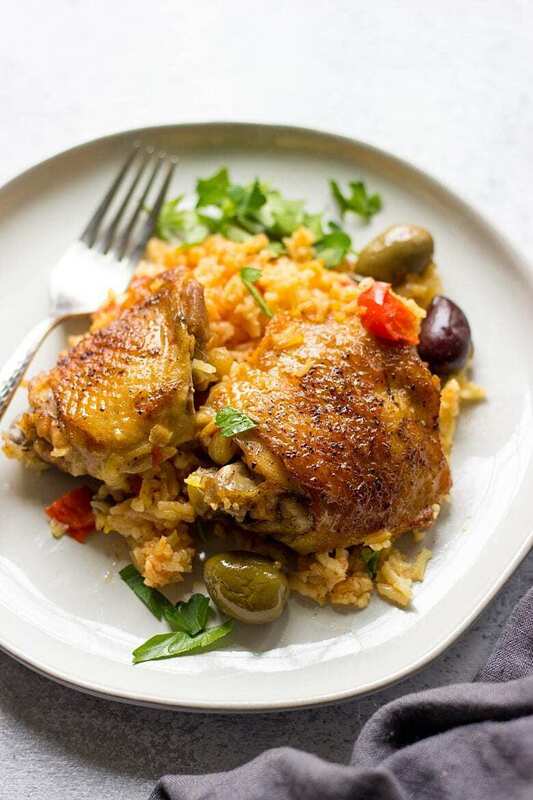 Bursting with flavor, juicy, hearty and comforting, this Spanish Chicken And Rice makes a delicious one pot recipe for the whole family. Perfect for a weeknight or Sunday dinner. Despite that I’ve been blogging for several years now, I came to realisation that Gazpacho was the only one Spanish recipe that I ever shared with you. It’s a traditional Spanish soup that I made in the very beginning of my blogging journey. Recently I republished Gazpacho recipe with much more attractive pictures and I strongly encourage you to try this delicious summer soup for yourself. In the middle of 2000s I had an amazing opportunity to visit this beautiful country. I fell in love with it at first sight. Despite that Barcelona was the only place that I’ve been too, I was totally mesmerised by its rich cultural heritage and breathtaking beauty. Every street, every corner of Barcelona can tell its unique story. Probably one of the most beautiful things that I’ve ever seen was architectural design by Gaudí. His unusual and distinctive works are scattered all across the city. We loved touring the same streets of Barcelona in the day and nightlight. 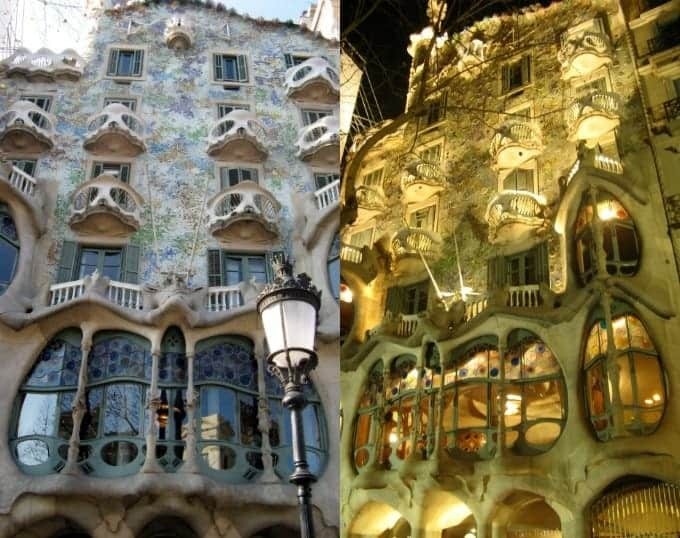 The beauty of Gaudí design becomes even more prominent at night. 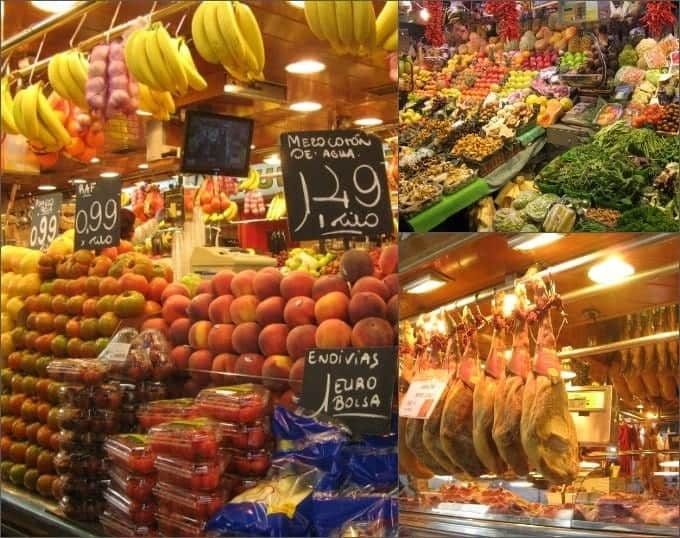 And of course, as any European country, Spain is a famous place for the gastronomical delights. Think Gazpacho, Paella, Tapas, Crema Catalana. While in Barcelona, we were lucky to try a few of those dishes. We were absolutely blown away by the combination of ingredients they use and incredible flavor of everything that we ordered. Up to this day, Gazpacho remains one of my favorite soups for a hot weather. And Paella is a pure comfort food. My husband haven’t been to Spain yet, but whenever I tell him stories of my international journeys, I can definitely see his interest. Despite that now, with 2 young kids, it’s quite difficult to travel long distances, I hope that one day, I’ll be able to come back to Spain and explore even more of its beauty and cuisine. Speaking of paella. 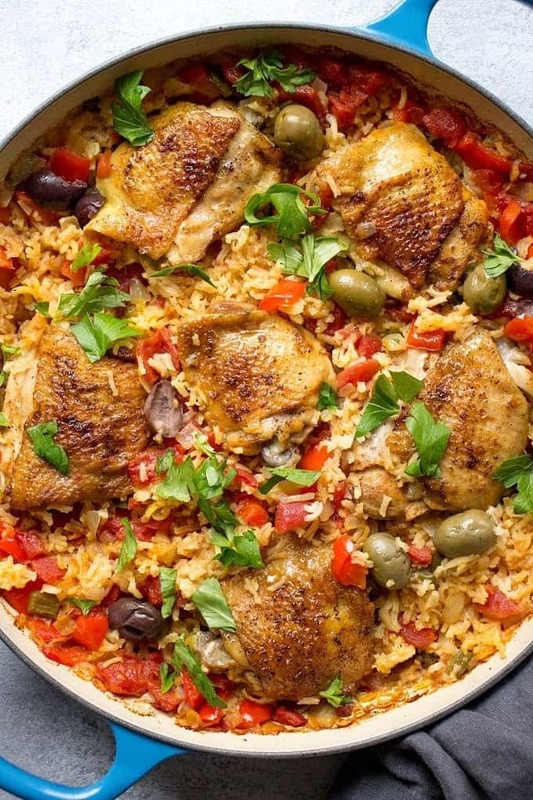 Today, I’m sharing with you a One Pot Spanish Chicken And Rice or Chicken Paella Easy Recipe. It has everything to delight your taste buds and turn a regular supper into a Spanish-inspired family meal. And speaking of easy. More and more I’m starting to love one pot recipes. Back in the days, I never really payed attention to how many pans and pots I use. 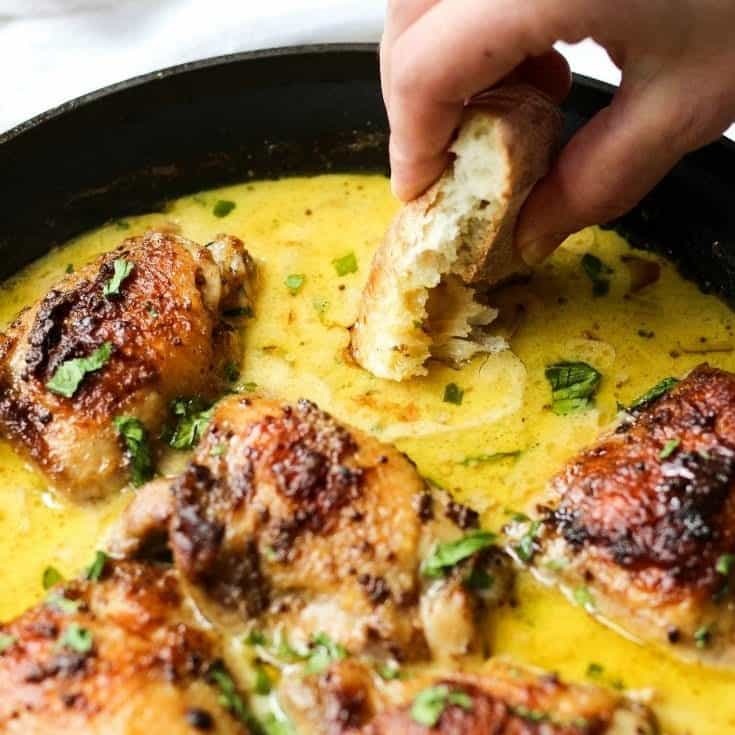 But now, when a recipe like this is on the menu, it makes my heart happy knowing that more delicious food is on the table and less dishes to clean. Win-win situation! As with many of my recipes that require some oven time, I’m using my favorite oven-proof Le Creuset Braiser. It’s big enough to make a dinner for the family of 6 and is so versatile. You can use it for cooking so many types of recipes. Start off with preheating your oven to 355 F and rubbing chicken thighs with some salt and pepper. Here you can use chicken drumsticks or chicken breast in place of the thighs. See my substitution tips at the bottom of the recipe card. Now, heat a little bit of olive oil in the ovenproof pan and brown chicken thighs until nice and crispy, about 5-4 per side. Remove them to a plate and set aside while you prepare the rice. Now you have the remaining tablespoon of olive oil that the recipe calls for, so go ahead and add it to the pan. When the oil is hot, add rice, paprika, white wine (which you can omit if you want), give it a stir and cook for 3 minutes. Add saffron, tomatoes, bay leaf, salt, pepper and chicken stock and bring to a boil. Place chicken on top of rice, cover the pan with an ovenproof lid or a foil and bake for 30 to 40 minutes until rice and chicken is cooked. It’s always a good idea to check the doneness of meat with an instant meat thermometer. It should read at least 165 F in the thickest part of the chicken. Now, all you have to do is stir in olives, sprinkle with parsley and serve! Yummy! Gazpacho – one of the most popular Spanish tomato soup recipes that doesn’t require the use of a stovetop. Watermelon Tomato Salad With Goat Cheese – simple and delicious Spanish inspired salad that pairs beautifully with meaty dishes. 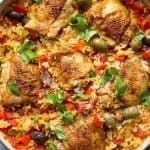 No jokes, my SPANISH CHICKEN AND RICE is a super comforting recipe your family will thank you for. 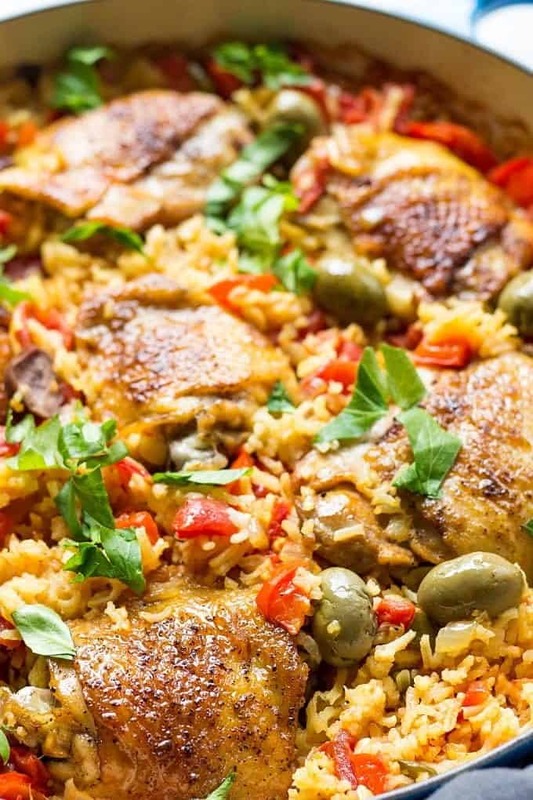 This Chicken Paella Easy recipe is bursting with flavor and perfect for busy weeknight meals. Preheat the oven 355 F.
Season chicken with ½ teaspoon of salt and ⅛ of pepper on each side. Heat 2 tablespoons of olive oil in a large Dutch Oven pan on a medium heat. Cook chicken on both sides for 7 minutes until skin is crispy and brown. Transfer chicken to a plate and wipe the pan. Heat the remaining tablespoon of olive oil in a pan and saute onion, garlic and both peppers for 3 minutes. Add paprika and rice and cook stirring until well coated. Add white wine and cook for 3 minutes. Stir in saffron, diced tomatoes, bay leaf, remaining salt and pepper, chicken stock and bring to a boil. 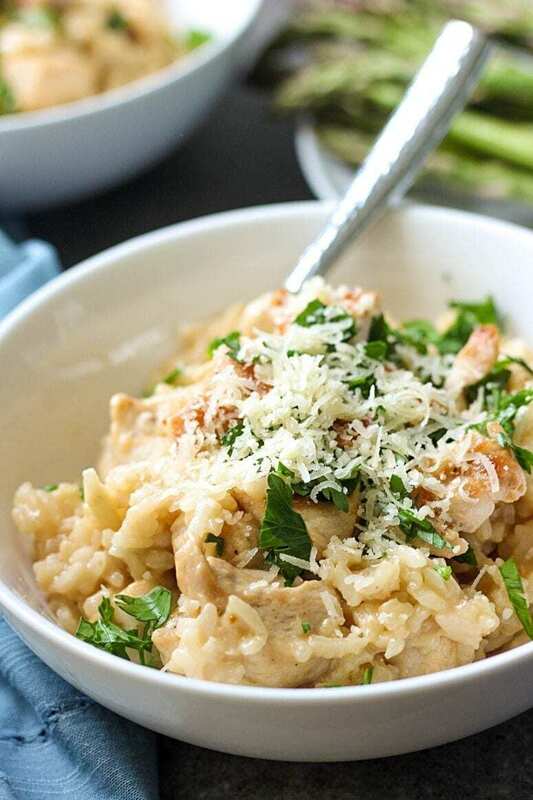 Place chicken on top of rice, cover a pan with an ovenproof lid or aluminium foil and braise in the oven for 30-40 minutes until rice is cooked. Remove from the oven, stir in olives. Sprinkle with parsley and serve immediately! For this recipe you can use chicken drumsticks or chicken breast in place of chicken thighs. For drumsticks cooking time doesn't change. However, if you use skinless and boneless chicken breast, reduce the initial browning time to 3 minutes per side and cook in the oven for no more than 20-25 minutes. If you have an instant meat thermometer, it should read at least 165F in the thickest part of the chicken breast. If you don't want to use the wine, that's OK. Simply skip it. The dish will still be very delicious. If you make my Recipe for Spanish Rice And Chicken, make sure to snap a photo and post it on Instagram with a hashtag #lavenderandmacarons. Sonia, you can just omit it, no need to replace with anything. how much more liquid do i put for 3 cups of rice? I would add 4 1/4 cups of broth. 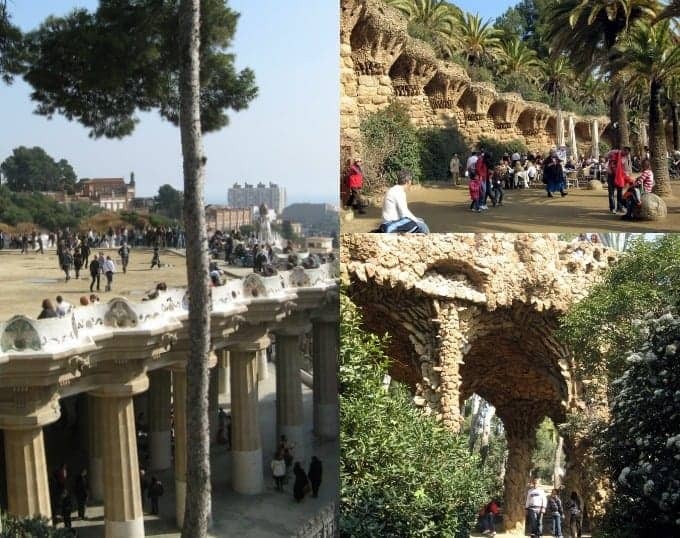 I love Spain, I have many fond memories of my travels there. My in-laws live there and I hope to take the kids one day. Especially for Christmas and the festival of the three kings. Love one pot dinners like this one! It is comfort food for the win! And easy clean up is bonus points! 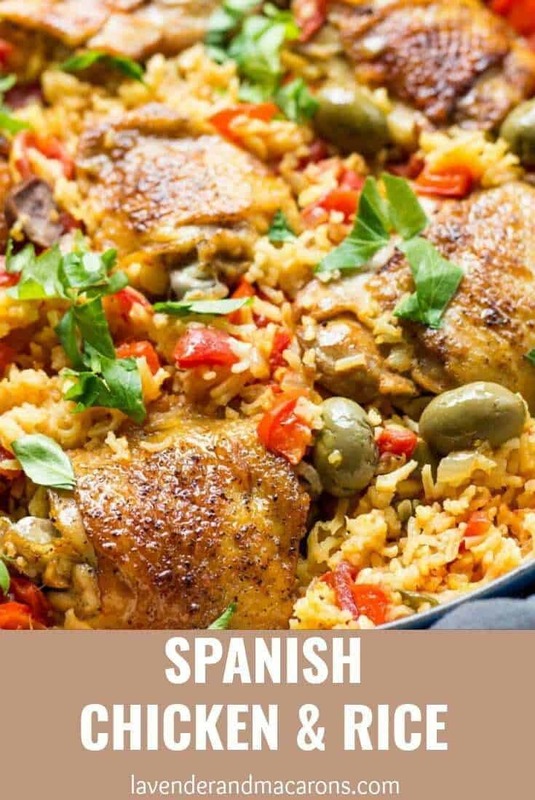 An explosion of Spanish flavors in one plate-that’s what I call this chicken and rice . Delicious and so flavorful ! What size can of diced tomatoes did you use, 14oz? Also, there is mention of adding wine in the directions but none on the ingredient list. Would that be the same as the broth? Hi Kelly! Yes, I used 14 oz can size. There is actually wine in the ingredients:) I used 3/4 of a cup of dry white wine. Hope that helps! Can this be done with chicken BREASTS? If so, how should cooking time be adjusted? Thanks. You can definitely use chicken breasts. I would cut it into small pieces, brown on each side for 3 minutes. And then continue with the rest of the steps according to the recipe instructions. Hope this helps!